Don’t try to make a standard rubber part fit your custom design. Whether you need molding products made of homogeneous rubber or rubber bonded to metal or other substrates, our customers return again and again because of the quality of our product and the dedication of our customer service team. With a full range of elastomers available to meet your demanding material specifications, Mason Rubber can prototype, mold products to your specifications, and consult with your engineers. We can custom mold products from a variety of polymers, including (but not limited to) Silicone, Neoprene, EPDM, Fluoroelastomer/Viton®, SBR Rubber, Nitrile (NBR), PVC Nitrile, Fluorosilicone and Natural Rubber. Using the latest injection, compression, and transfer molding technologies, we efficiently manufacture products of various sizes and configurations with varying degrees of complexity. And, in order to ensure prompt delivery, we inventory many of the more common raw materials. Large Part Molding – Our hydraulic molding press capacity ranges from 12” x 12” platens up to 34” x 36” platens. 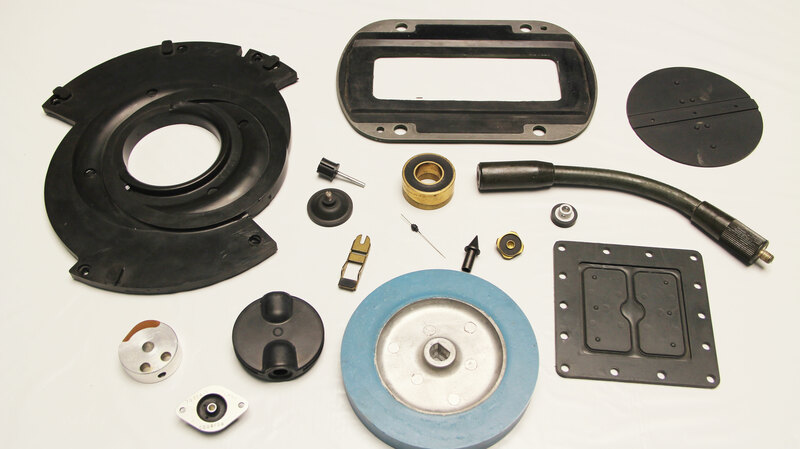 Because our forte is the manufacturing of custom molded rubber parts, we can manufacture virtually anything—from basic to complex and intricate parts. The parts we create are used within many different industries, from Aerospace to Energy to Medical, to name a few. Our extensive knowledge of rubber polymers, elastomers and rubber to substrate bonding allow your designs and ideas to become reality.